A friend who recently moved back to the U.S. after 20 years living abroad ended up in San Francisco, one of the most dog-friendly cities in America. She told her landlord that one of the aspects of moving back that surprised her most was how much more devoted Americans were to their dogs than she remembered. Her landlord agreed. One of his tenants, he said, had neglected to pay her electric bill, and when the electric company shut down service to her apartment, she lost $150 worth of refrigerated dog food. She was very upset about this. The landlord himself was preparing for a year’s sabbatical in the south of France. He’d had his dog registered as a service dog so she could come along (she performs the service of sniffing out allergens in his children’s food). His family managed to find dog-friendly housing in Biarritz and the dog would be allowed on the beach. His only complaint was that dog-walking services there were scarce. This is all to say that there is likely an audience for Feed Me: 50 Home Cooked Meals For Your Dog by Liviana Prola, which was recently published in its first American edition by Phaidon last week. Prola is Italian, a research scientist in the department of veterinary science at Turin University, and president of the Italian Society Of Animal Nutrition. It’s a handsome book, printed on heavy stock and filled with adorable line drawings of dogs. It’s also full of detailed advice about why it’s better to cook for your dog than to feed them store-bought food and how to navigate the transition from kibbles to home-cooked meals. Each of the 50 recipes contains a balance of proteins, fats, minerals, and vitamins, and some are designed especially for puppies or senior dogs. None of them, however, can be properly prepared without Balance IT, a nutritional supplement that retails for about $60 for 600 grams. This is solid veterinary advice; at least it tallied with what my own dog’s vet told me last fall when I considered switching to homemade dog food. It is also very expensive: even if you only use Balance IT at the rate of 15 or 20 grams per meal (or 30 to 40 grams per day), $60 for a supplement is a lot. That’s not counting the other ingredients in Prola’s recipes, which invariably contain meat, because dogs are carnivores. Some of the cuts are cheap—pork neck, chicken liver—but even those add up. Let’s say, though, that you are the sort of dog parent for whom money is no object, like my friend’s landlord or his tenant who was willing to sacrifice electricity for dog food. You’re totally fine with stockpiling canisters of Balance IT and buying chicken and veal in Costco quantities, and you have the time and freezer space to spare. Is Feed Me worthwhile? It’s a serious book. It doesn’t have ridiculous anthropomorphism or cutesy references to “fur babies.” It lists exact calorie and nutritional information for every recipe, depending on the age and weight of the dog you are feeding. At the very worst, if you really get into it and go through the whole program, your dog will likely be healthier than you are. A lot of this cookbook’s recipes are oddly retro: pasta salads, casseroles, quenelles, molded rings. There are no pictures in Feed Me, but if there were, I’ll bet they would look a lot like the photos from midcentury cookbooks on the now-defunct website Gallery Of Regrettable Food, many of which do, in fact, look like dog food. It’s fortunate that dogs don’t have the same aesthetic sense that we do; they are far more likely to appreciate a strong aroma than meticulous plating. Abby and I began with the Pasta Salad With Pork, Endives, And Yogurt. I’d never cooked endives or pork shoulder before, and I wasn’t quite sure if I was carving the meat from the bone correctly. I ended up with slightly less than the 400 grams the recipe called for. The result looked like a human pasta salad, gloppy and shiny. It wasn’t clear how much I should feed Abby: She weighs 55 pounds, but the weights on the meal-size calculation table skipped from 44 to 66 pounds. I settled on a portion in the middle. Abby was suspicious at first, but once she got going, she attacked the bowl. The recipe yielded enough for a second meal. Next up was Beef Roll And Potatoes. The other ingredient, besides oil and the supplement (which we skipped), was kefir. The final result was supposed to be solid enough to form a log that I could cut slices from, but that didn’t happen. Instead I ended up with a pale, glutinous substance that looked a bit like vomit. That didn’t bother Abby in the slightest; she licked the bowl afterward. Sadly, this recipe did not yield enough for leftovers. 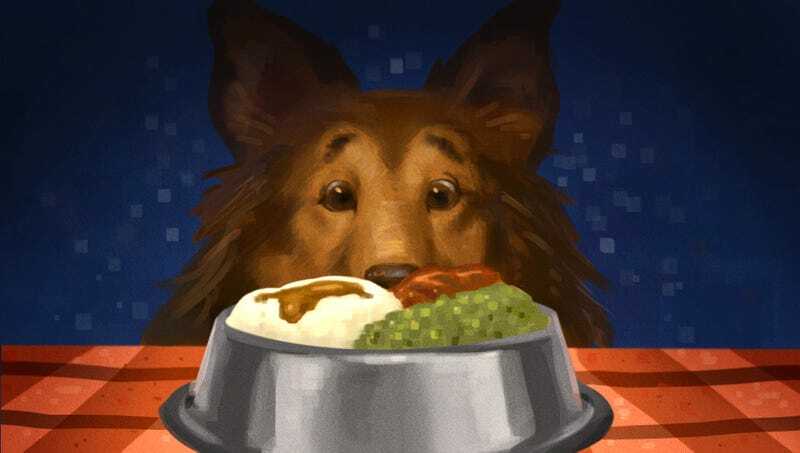 On the scale of eating enthusiasm, the Feed Me recipes generated more than dry kibble, but about the same as canned wet food and dog ice cream. That means Abby will be getting fancy, home-cooked meals for special occasions like her birthday, but not as a regular thing. I don’t even feel guilty about this. In life, some sacrifices must be made. We will continue to have our long walks and trips to the dog beach and visits with various friends around the neighborhood and all the rest of our cheap luxuries. But maybe someday, if I ever strike it rich and have tons of disposable time and income at my command, I will start cooking regularly. Abby may even appreciate it.